Mortality certainly does put a damper on things. The fact that the time we have, not only in our time on Earth but ultimately in everything, has set limits is a very sobering realization, yet ultimately one that makes life very much worth living. If we had all the time in the world, would we accomplish anything? How much would life mean to us if it was unlimited? Well, sadly, it is limited, and during this time one of the many fulfillments we can enjoy is uplifting music that reminds of how much fun the time we have left here can be. Such sentiments lie in the music of Flogging Molly, the Los Angeles-based group of Celt-punks who have taken the punk world by storm over the past decade with a musical arsenal overflowing with blazing harmonized fiddle, accordion and mandolin lines backed by a raucous rhythm section consisting of raging electric guitar, chugging bass and rampant, ever forward-pushing drums. Thrown on top of the reckless Irish punk marching band are the heart-torn vocals of Dave King, whose lyrics speak to both the celebration of life and the war-torn history of his home nation of Ireland. Currently, Flogging Molly are preparing for a tour of the United States starting in New York City at the Hammerstein Ballroom on Feb. 15 in support of their latest studio effort, last year’s Float. 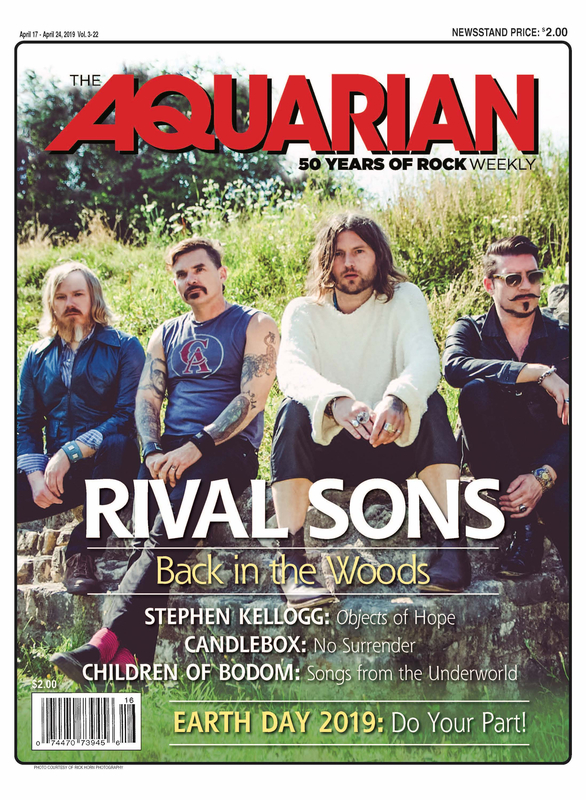 Guitarist Dennis Casey was kind enough to spend a few moments speaking with The Aquarian about the band’s latest album and the beliefs that propel the band forward as musicians and people. I read that Float was the first album that you recorded in Ireland. Do you feel the environment lent anything to the album? I would say the fact that we did it over in Ireland wasn’t as much of an influence as that we all lived together in one house for the writing and then for recording as well. Dave lives there and we found a house to rent down the street from him. That was the first time we’d ever gone as a band and rented a house and lived there and then played music. We did all the other records in Dave’s garage in L.A. That was pretty much, you work a couple hours, rehearse and then people can go home and go about with their daily lives, whereas here we just concentrated on making music all day. Then we would go out to the pub at night and we would just talk about what we did. I think that was probably a bigger influence than the fact that we were in Ireland because we did it in the garage of the house and once you close the garage door you could be anywhere. So you guys were pretty much closed off from the rest of the world other than this little piece of Ireland? That was what was really different. None of us had ever done anything like that. A nice part, too, was that it was about a 10-minute walk to the ocean so you could take a nice walk to the ocean and clear your head out a bit. That was beautiful and nice. There was beautiful rolling countryside. We had a purpose though, so we spent a lot of time in the garage with the door closed and that could be anywhere. It sounds like you wrote and recorded the album in a very relaxed, meditative environment. Considering you are a punk band, most would assume a better place for you to create would be a rowdy, raucous environment. Dave is the principal songwriter and for him to write songs I think he’s got to be in the right headspace in the right environment. He’s usually really comfortable writing at home with his typewriter and his guitar. When it comes to the rehearsal room, no matter where it is, I think that the band is just going to get together and what we make is Flogging Molly. I don’t think our environment is that influential. If we went to Morocco or something like that then it would be a whole different story. Do you feel that Ireland is a good environment for punk rock music, since it has had a history of oppression from Britain and punk rock’s dedication to rebellion and liberation? I know it has influenced Dave. He is the only one from there. The history definitely plays a role in our music and it influences Dave. I grew up here in the States, but living in a country with war, terrorism, oppression, and the history of it—I’m sure it all really plays a part in our music. When we were there, there was prosperity. Dave wrote a song called ‘Patty’s Lament’ which is about that—how there’s prosperity and peace now in Ireland. The song sort of addresses the past and the present with that in mind. Within A Mile Of Home was dedicated to Johnny Cash and Joe Strummer. Could you describe how Flogging Molly has been influenced by both folk and punk rock, not only in sound, but attitude, lyrical content, etc.? I think we all share an admiration for both artists, so that was kind of a mutual adoration. We respect them as artists and were influenced by them, Johnny Cash with his attitude and who he was as a musician. In other words he had his ups, he had his downs, he did things his way and he has a tremendous amount of integrity. I think it is hard not to be influenced by a musician such as Johnny Cash. Joe Strummer—he stood for something and he said something with his music and he was never ‘the rock star.’ We were lucky enough to meet him and play with him one time a few months before he died. He was humble, no attitude, no separation between you and him. It was just like you had known him all your life. He was very welcoming. Funny story: We played in Vegas with him at The House Of Blues. There is a thing called The Foundation Room. We were going to go up there for a drink, but Joe couldn’t get up because he didn’t have his VIP pass and the security guard was vehement about not letting him up. He didn’t know who he was. Joe was just like, ‘That’s cool,’ and went to the main bar in the casino. He just hung out there with a ton of fans that were hanging around talking to him. That really inspired me because he was a living legend but very accessible. I read that you have a strong belief in unions and workers and the working class. My family was all union workers for I don’t how many generations. All these families are raised as union workers and it’s funny that if you look at the times today compared to then, people could have these union jobs and buy a house and live the American dream. If it weren’t for unions there wouldn’t be a 40-hour workweek, there would still be child labor. Unions did a lot for the working class and this country. That’s where my admiration and my belief in that come. There is a definite strength in people uniting and coming together as one to champion their ideas and beliefs. Is that something that propels Flogging Molly? People coming together for their beliefs? I would say at the end of the day there is a faith in what we are doing. We have been together for over 10 years now, same line-up. I think that is a testament to what we believe in and how we are dedicated to this. I don’t want to say our music as cause, but we believe in it. It’s not to become a rock star. It’s to play music and to celebrate life. I don’t want to sound too high-falutin’; at the end of the day it’s just rock and roll. But if you want to dig deeper, all of us believe in this music that is bigger than each one of us. I think we have this connection. We probably would never have even met or known each other in real life if it wasn’t for this music, but we all have this similar thing in common and we’ve come closer through it. You were saying earlier that Joe Strummer and Johnny Cash were musicians who stood for something. What does Flogging Molly stand for? What I hope that Flogging Molly would be remembered for would be music that could touch you in a way that, I guess helps you and moves you in a way where you would—it’s hard to put it into words. I hope that at the end of the day we are a band that touched you, made you look at things a little differently, but also when you saw us live you had one of the best times of your life. At the end of the day, we’re still alive. We still have a chance. I’m saying this in light of that there are a lot of soldiers and a lot of families of soldiers that come to the band and tell us what the music means to them and there is no bigger compliment than the stories you hear, even from people that aren’t soldiers. One guy got our lyrics written on his grave and our songs are played a lot at funerals. That means a lot to a band like us. It means we are touching people and affecting them in a way that is hard to do without music.